Have questions or need help on any saltwater aquarium supplies? We can help! We are happy to help with any questions you may have. Contact us on here, call us, or email us anytime you have questions. 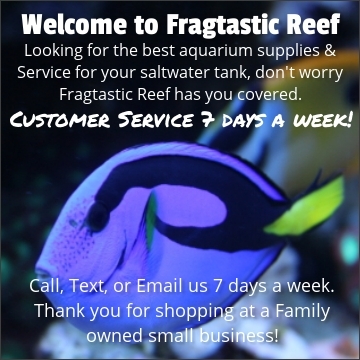 Thank you for shopping at Fragtastic Reef and we can't wait to hear from you! You can also visit our Retail Store in Mankato, MN for any questions or aquarium supplies you would wish to pickup at our store. Our store is open by appointment so please give us a call if you need anything. You can find our location and information on the right side of this page for our brick and mortar store. FragtasticReef.com is a full retail local fish store with a full website with all the products we carry. We sell all the best brands for saltwater aquariums both online and at our store location in MN. We have years of experience and can help you with a full setup or just the items you need. Be sure to also stop into our retail location if your every in MN for all the fish, invertebrates, and coral frags you need! Retail Store Hours in Minnesota By Appointment - Call Us to setup an appointment time.